By Daniel Horowitz—As cities across the globe mark the annual Holocaust Remembrance Day (Yom Hashoah V’Hagvurah), approximately 1,500 spectators from across the GTA made their way to UJA Federation’s Joseph & Wolf Lebovic Jewish Community Campus in Vaughan on Sunday, April 7th for a moving event. The event, co-sponsored by UJA Federation of Greater Toronto’s Sarah and Chaim Neuberger Holocaust Education Centre and the Canadian Society for Yad Vashem, commemorated the 70th anniversary of the Warsaw Ghetto Uprising that saw Warsaw ghetto fighters fire upon German troops in April, 1943, as they tried to round up another group of ghetto inhabitants for deportation, with only a small supply of weapons that had been smuggled into the ghetto. After a few days, the troops retreated. This small victory inspired the ghetto fighters to prepare for future resistance. “This day is to remind us about the sacrifices of a small group of young brave men and women who fought the Nazis in the Warsaw Ghetto 70 years ago,” said keynote speaker, Amek Adler whose family was fortunate enough to escape the Warsaw Ghetto in October, 1940, just a month before the walls were erected around the 3.4 square kilometers which would be home to 400,000 imprisoned Jews. “As a young boy of 11 or so, seeing the dead bodies lying in the streets for pickup from starvation will be a scene that will stay with me for the rest of my life,” added Adler. Among those in attendance at the commemoration event were numerous federal provincial and municipal politicians who came to mourn as we remembered the 6 million slaughtered in the Shoah. Master of Ceremonies Lou Greenbaum read greetings from Stephen Harper, Prime Minister of Canada, Kathleen Wynne, Premier of Ontario and Maurizio Bevilacqua, Mayor of Vaughan. In addition, Dr Mario Silva, chair of the International Holocaust Remembrance Alliance (IHRA, formerly ITF) in 2013 was at the event. DJ Schneeweiss, Consul General of Israel to Toronto and Western Canada, was also on hand to deliver a compelling address. “I am so proud of our community and our country’s dedication to Holocaust remembrance,” said Honey Sherman, Chair, UJA Federation’s Sarah and Chaim Neuberger Holocaust Education Centre. 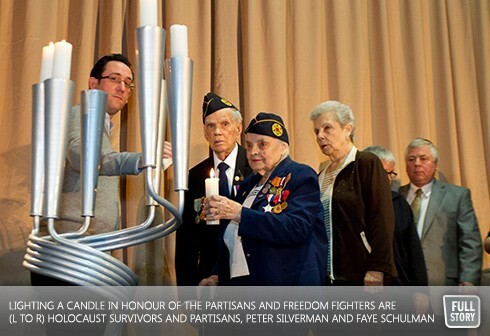 “The event was a wonderful tribute to our Survivors and to their strength to move forward with their lives,” noted Fran Sonshine, Chair, Canadian Society for Yad Vashem.